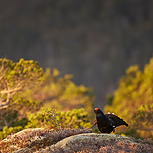 One of the most amazing sights and sounds of late spring is to be woken before dawn by the sound of a lekking Black Grouse or Capercaillie. This trip to well-established sites in Norway will give you a fantastic opportunity to experience and photograph at close quarters the dramatic poses, antics and displays of these amazing birds as they look to establish and undertake breeding rights for the season ahead. You’ll stay overnight in small, carefully prepared hides ready for the birds’ early morning antics, and with possible daytime opportunities including Black-throated Diver, Sea-Eagles and Red Squirrels, it’s a jam-packed week and a real tonic for the start of the summer. Day 1: We travel to Trondheim (we will advise you on our flight recommendations) where we will be met by our Norwegian Guide Ole Martin Dahl. Ole then drives us (about 3 hours) to our base in Flatanger, where we will be based for the duration of the trip. We will have an early dinner on arrival. Days 2 – 7: The precise schedule will be very flexible based on a combination of the elements and individual priorities. We have three hides available to us for the duration of our trip. For the capercaillie lek these are one-man dome hides that will be in a permanent position throughout our stay; each of us will spend at least one night in this hide to get the chance of photographing this amazing spectacle. If it is your turn in the capercaillie hide, then you will have to be in here from dusk the night before because the male capercaillie roosts in the trees right above his lekking arena. So, once you are in, you will need everything in with you and you will not be able to leave the hide throughout your stint. The lekking activity is generally over by about 9am the next morning. The rest of the group will spend the night in a wooden hide overlooking the black grouse lek. Again, we must be in the hide the night before but there is room to sleep and there is a proper toilet too. We should also get the opportunity to work from a one-man dome hide that overlooks another black grouse lek and this gives a different perspective to the fixed wooden one. With all lekking over by midmorning as well as some rest time back at the house where we are staying we will also get the chance to go out on the boat looking for sea eagles in the Fjords. We will also be targeting Black-throated Diver from our small hides at the waters edge. It is a tiring week but to get the best out of it, it will be worth it. Day 8: Sadly we will return back to Trondheim Airport for our return flights back home. Capercaillie and black grouse are incredibly difficult birds to approach and photograph. It only becomes possible at a location for them to be remotely reliable in terms of visiting that sight regularly, and that is what our guide Ole in Norway has done for us – this location is among the most reliable in Europe. Those years of work and effort can be destroyed very easily, as they remain incredibly wary birds – it is why we must enter the hides the previous evening and we can only leave them when we are sure the birds have finished lekking: any association between people and the hides will mean the birds won’t return. The same applies when they do arrive, and we have the chance to photograph them. You must play the long patient game – quite a challenge if you’ve been sitting for several hours waiting for them to arrive. The birds must be allowed to settle first time of arriving before you start snapping, movement and noise must be at an absolute minimum and you must have your camera on single shot mode – machine gun firing as the first bird lands will ruin the morning and possibly the whole trip for you and for others too. If you have any concerns or questions, feel free to call me. Airport transfers, accommodation, local transportation, all meals and use of hides. Photographing lekking Grouse and Capercaillie involves arriving in your hide the evening before and awaiting their arrival at dawn for early morning photography. These hides will be a mixture of wooden and tent based so there will be an inevitable degree of discomfort and adventure, including a night on your own in the forest. With some walking to access the hides this is a tiring but rewarding trip.